These days, the sound of a Mariachi band is synonymous with festivals and parties. You'll often hear them at kid's birthday parties, at restaurants going throughout the place playing serenades, or at celebrations such as weddings and quinceaneras. Their colorful costumes and joyous music quickly add a festive atmosphere to any gathering. 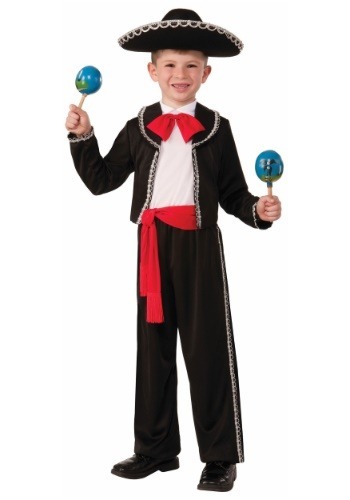 It's in this spirit that we present to you this Boys Mariachi Amigo Costume. This costume is the perfect idea for a party or a unique Halloween outfit. It's 100% polyester fabric, and the jacket shirt combo fastens with Velcro at the back of the neck. The red bow tie is sewn to the front of the collar, so it won't fall off, and the jacket is trimmed with metallic silver braid. The pants have an elastic waist with silver braid along the side seams. The red sash is 48" inches long with 4 inch wide fringed ends. It's a festive choice for your child this Halloween!